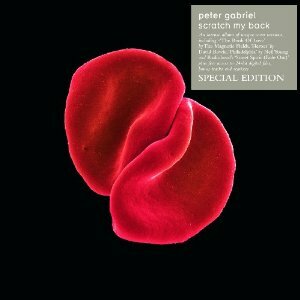 Peter Gabriel's new CD "Scratch My Back" is interesting for a couple of reasons. One is that it has a cover of the Neil Young song "Philadelphia" from the Jonathan Demme film of the same title. The other dimension to this is the one that is being most discussed in the music business. That is -- with plummeting sales -- what are we going to do? Doing song covers is certainly not a new phenomenon by any stretch. They're done for a myriad reasons. Artists pay homage. They like the song. Help raise awareness and expand an audience. A nice way to say thank you for helping me one day. And we'll come back to this in a moment on why -- as a blogger -- we find this relevant. Secondly, these songs have been approached from an angle that's rather revolutionary. Peter's usual band have been dispensed with on this project, leaving his voice accompanied solely by orchestral instruments. The approach makes for some radical reinterpretations. 'After all,' protests the album's arranger John Metcalfe, 'what's the point of covers that don't make any effort- So many are just really the same song with a different singer. Here was an opportunity - particularly as it was orchestral - not to do that, to reinterpret these songs with integrity.'" Some have called this proposition opportunistic, a way for Gabriel to both reassert his place alongside more iconic elders and make a DNA connection with arty youngsters. In fact, the gesture's more natural for Gabriel than it's been for most sexagenarians who've sought a lift from the kids. He's a lifelong collaborator whose WOMAD festivals and Real World label have cultivated a serious international music community; and his current nonmusical projects, like the Hub ('a YouTube for human rights'), imagine Internet-driven connectivity as a kind of potlatch. More questionable is Gabriel's rendering of his half of the exchange. Instead of highlighting what younger artists actually seem to love about his own work -- its cosmopolitan spirit, written in the rhythms of soul, qawwali and Afrobeat -- Gabriel has gone for an exceedingly Western art song approach. No bass, no drums from the man who gave us 'Sledgehammer'? Why? I'd guess that Gabriel has a higher goal, as usual." Now back to why we think this is relevant here. As regular visitors know by now, one thing we do here is link over to other blogs. And they link back. Same concept of back scratching. To point out the obvious, it's trying to create a virtuous circle. By now it seems a lot of folks are on Facebook and the concept works the same. Be my friend and I'll be yours. Build the network for what ever your reason. So, link to our blog and we'll link back to yours. Or -- in the words of some singer-song writer from back in the 1970's, be on my side and i'll be on your side. There is no reason for you to hide. Bruce Springsteen's contribution to the soundtrack of Philadelphia was the more celebrated, but this Neil Young track was surely the most beautiful. This version marks Scratch My Back's tenderest moment, its gently undulating melody matched by the empathetic delivery of Young's lyrics. Gorgeous trumpet solo too. Listen to sample tracks of Peter Gabriel's "Scratch My Back" and the Neil Young song "Philadelphia" on Amazon.com. And here's one of the all-time high career points: Neil Young at the 1994 Oscar ceremonies playing "Philadelphia". The new Peter Gabriel album on Thrasher's Wheat? I think I'm dreaming! I love Peter Gabriel as much as Neil! Two of the best! I'm wondering what will be Neil's choice for the "song swap" project. Gabriel's version of "Philadelphia" is very good, although it is close to the original. Last weeks Olympic Ceremony was a career high point for Neil. Not a propaganda awards show! Don't sell out Thrasher. Soughta like a swap meet hey! "Some have called this proposition opportunistic, a way for Gabriel to both reassert his place alongside more iconic elders..."
Thom Yorke and David Bowie have declined participating, Neil should too. I just think the Olympics was a much bigger deal than performing at the Oscars. Neil had an audience of Millions and Millions last week. Literally the entire globe. The Oscars just have the ritzy and razz of Hollywood. I like the idea a lot. Coming from a guy like Gabriel who has pushed music in a lot of ways I'm not too concerned from the standpoint of integrity. I also like the possibilities of other like projects that would give exposure to music that otherwise wouldn't come to mine or other peoples attention. It would make for some fascinating connections, and give constructive insight into what artists value in other artists. I'm on board with it. I've been linking here for a while now, because where else will anyone find Neil news? Thom Yorke hasn't declined, that's media spin. David Bowie declined because Eno says he has no interest in music whatsoever anymore; hence why Gabriel chose a Bowie/Eno song, so Eno can return the favour. Those who call this "proposition opportunistic , a way for Gabriel to both reassert his place alongside more iconic elders...", including anon at 3/07/2010 03:56:00 PM clearly have no idea who Peter Gabriel is in the first place. - Peter Gabriel has said he is having trouble getting Radiohead's Thom Yorke to contribute to his 'song swap' scheme." - But Gabriel revealed: "Sadly, David Bowie is the only artist that said he clearly didn't want to play with the song swap - I don't think he's doing much music at the moment." - Not only do I know who Peter Gabriel is, I‘ve heard Scratch My Back. The selection of songs is better than the execution. It would be a good film score but as an album, it fails. Dull, dull, dull! And Thrasher – good luck with the linking thing, the groupthink of your regular ‘wheaties and rusties’ and their flaming attacks on those who dare to express a view contrary to the consensus is not likely to contribute to your stickiness. Not sure exactly what you're driving at here? If you're serious about having an honest discussion, I'm more than happy to engage. Obviously, the last thing I'm interested in here is a giant group think. What exactly are you driving at and what are your suggested improvements? I think this is a thing Gabriel is doing. It'll be interesting to hear how Neil Young returns the favor. What bugs me about the people attacking Peter for doing this, is that this is something all artists have done for time immemorial. We all cover each others' songs. Neil's covered peoples' songs, people have covered his, etc. Tons of artists do this, and they always have, it's a good thing, and it's nothing new. 1. You pay homage to an artist you enjoy, or are inspired by, by covering one of their songs. 2. Friends share songs back and forth as a way of supporting each other. 3. This behavior further develops musical community. It's never been about getting rich off the back of someone else, or self-promotion using someone else's fame. That idea is truly a crass, skewed capitalist accusation. People are taking something that's more Communal, and applying it to a Capitalist mindset, which is why they come out with these accusations. They can't imagine people doing anything not for the express, simplistic purpose of making money. That's where they go wrong. Sometimes people SHARE because they want to SHARE, and for no other purpose but to share and make a show of respect for artists that they think are important and good, and perhaps inspirations for their own creative endeavors. The whole "I'll scratch yours" thing is a great twist to it. Instead of waiting for other people to return the favor, Gabriel is actually recruiting them in advance for it. That's the only "innovative" aspect, but it's still the same thing that's been going on in music for as long as music's been around. Good points. I'd agree that there's so many who find it very easy to knock something down -- even it's very well intentioned. I'd rather have something sincere & genuine -- yet flawed than perfection that's marketed & manufactured. I think Scratch My Back is a great album! Looking forward to Neil's contribution for sure! Thanks for allowing us to discuss this here, Thrasher, I was wondering what other Neil fans thought of Peter's cover. Thrasher - Well Matthew would be a good example. He thinks that I am attacking Peter Gabriel for recording covers, I said he did the covers badly. Matthew has not heard the album. Are you sure? you should google the eight symptoms of groupthink. At 3/08/2010 05:20:00 AM, Anonymous called me an A$$hole, he obviously disagreed with my comment. I consider that flaming. 2. Rationalizing warnings that might challenge the group's assumptions. 5. Direct pressure to conform placed on any member who questions the group, couched in terms of "disloyalty". Wow. Are you implying that TW somehow meets these 8 criteria? Man. Don't you think that out here on the internets, that's its impossible to even attain a single one of these? Look. If you're hung up about your or someone else's comments being deleted, pls review the comments policy which is linked on every comment page. Then read the commennts. It has everything I've ever had to say on subject. Neil Young News: Things Get Even Stranger over Greendale Toy Train? Neil Young News: "Gang of 400" - Thrasher's Wheat's Cabal? And we'll just say that if that's what we were trying to achieve here well... Either we've been woefully unsuccessfully. Or we just never wanted it to be that way. I guess I would just rather have Perter Gabriel join Neil's band. We could bring back the Horse and he could replace Danny's vocals and vibe, keep Poncho for guitar and move on. now that's GROUP-think for ya! You are such a hypocrit sometimes..
and the word I used in my 1500th deleted post of "disalllusionment" is sadly apt. The fact that you never had the courtesy to answer a question, query or suggestion I ever make is just plain out rude. Yeah, I too, have read your 'comments policy' a thousand times..and yeah the random "silly' 'off topic' comment I might throw in from time to time just might contravene the "rules of engagement", but geez, give ME a break sometimes willya! Lets just reverse the saying "A picture tells a thousand words" to "a thousand words tells a picture"....lets just say, you've obviously made a false assessment of me as a person and I'm trying really, really hard not to reciprocate. That's all I've got to say on the matter. this much madness brings too much sorrow"
Woah, Sunny - you completely misinterpret me. I wasn't accusing you of anything at all, just poking fun at your 'group think' comment. My words between the parenthesis were a satirical jab, more in the spirit of fun than anything. The rest of my post had nothing to do with you thinking the covers are bad - I don't care if they're good or bad covers. That's not the issue. I haven't heard the covers, so can't comment on whether I like them or not - and that's a completely subjective thing. I wouldn't get down on someone for not enjoying something that I enjoy - that's ridiculous. I was simply attempting to debunk the general trend of referring to Gabriel (in this case) as either trying to cash in on other peoples' popularity or "position" himself in a position of association with "iconic" performers to elevate his own "status". I think all those arguments are incorrect. Artists have been covering each others' tunes for as long as they've been writing them. And artists generally do covers because they think they're great songs, and for no other purpose. And I was asserting my own belief that people have slanted 'capitalist mindsets' that cause them to think that every action by an artist is a crass attempt at making money (or social positioning). People always accuse Neil, for instance, of pretending to be "true" and using "artistic integrity" as a cover for being a Capitalist and ripping off his fans. While it is true that in a capitalist economy you basically work inside that system, and thus every record ever released by anyone has the secondary goal of generating income the artist, the overarching purpose of what Neil Young does is personal, and artistic, and not solely for the sake of making profit. It is a secondary consideration IF THAT, and Neil has released many albums that he KNEW would bomb, primarily because he doesn't care whether the vast majority of people like them - they are personal artistic expressions first and foremost. If they make money, that's just icing. So, no offense meant to you at all, man, I wasn't even referring to your comment in the meat of my argument. The only part that referred to you directly was the little joke at the beginning - because I think it's funny when people accuse us all of 'group-think' around here. If you want to debate 'group think', I'm happy to, but really it's such a moot point. The fact is that people come here BECAUSE they agree about something (i.e. Neil Young is effin' great!) so obviously you'll get a lot of people who agree with each other. It's just a social dynamic. There are no mindless zombies here (well, mostly), no group-thinkers, and no conspiracy to flame people who disagree with whatever the general consensus might be. Thrasher encourages debate. He has his own opinion for sure, but he's certainly not shoving it down your throat, and neither am I. Sometimes debates get heated, and it might seem like the minority opinion is being jumped on by the majority, but really that's just an illusion created by the fact that there is a majority who shares a certain belief, and there's a debate going on about something. If you think differently than the 'majority' opinion on something, you should be proud of your opinion man. I'd respect you for sticking to your guns and expressing it, whether I agree or not. Sorry, just to clarify with regard to my last post, my whole tangent out of the "Peter Gabriel is crassly profiting off other peoples' songs" debate and into the "Neil is an evil capitalist who is ripping off his fans" debate was meant as an example, and not to restart that specific debate. I rambled about it for a bit too long though. Sunny, I was disagreeing with the guy from the L.A. Times (who you agreed with). Whoever wrote that tripe got it wrong, ***IMO***. As a working musician, I think I can speak from experience, that when it comes to covers there are certain communal reasons that people play them that go way beyond crass capitalistic considerations. Unless you are in a cover band, of course, where your primary purpose is to make money by entertaining bar patrons by playing all the popular songs they know - that is a different animal altogether. I am referring more to - original artists covering songs by other original artists. Anyway, I have gone way beyond my quota and am now slathering the board with my comments, so I will shut up now. Thank's for the useful lesson! Started writing this 14-15 hrs ago, but got interrupted. Still will submit my comment though there's been many since: I love the album, and I'll be off to see Peter Gabriel in London.There are highs & lows on the album. Well it's all pretty downbeat (in a good way :) ).Not too crazy about the version of Heroes. Always thought Listening Wind was such a strong song. Glad Peter's covered it. Cried the first time I heard Philadelphia- beautiful rendition of one of Neil's most moving songs. Listening to interview http://realworld.co.uk/podcasts/petergabriel_scratchmyback_03.mp3 Peter started out with the concept of doing an album without guitars or drums so it could have ended up having ethnic rhythms "World" music. World music has become such a misinterpreted term. Frank Sinatra is World music- To me it's just having an open mind, or ears. The fact that Peter Gabriel has done an "orchestral" backed album - well it's different for him. Unlike Neil, Peter Gabriel only churns something out once in a blue moon. However, like Neil he does go his own way. It does help to have one's own recording studio, but it was not always like that, when sinking money into WOMAD had the creditors getting a bit nasty, and Genesis doing a bail-out concert. I really looking forward to hearing what comes out of some of the reciprocations- especially Neil's ! Anyway, here's to doing one's thing, or another's. "Power of the Heart"; My Body is a Cage" and "Signal to Noise" were just brilliant. So moving a rendition the first of those, and the other 2 - well they've just got to be heard live. See someone's put up a recording of "Signal to Noise" on YouTube-kind of ironic as the ratio re that of the title in that recording is all wrong . "Signal to Noise" is immense live. "Philadelphia" rendition was just put out there - a subdued interpretation. O2- well don't like the venue- but if on the floor and close enough and it's good.